These miniature candy bars were made using a Wilton mold I purchased from Michael’s Craft Store. This particular mold has 8 cavities that are approximately 1 inch deep, 1 inch wide, and 2 inches long. You can substitute any other candy bar (or large bonbon) molds you are able to find, but the ingredient quantities may need to be adjusted. 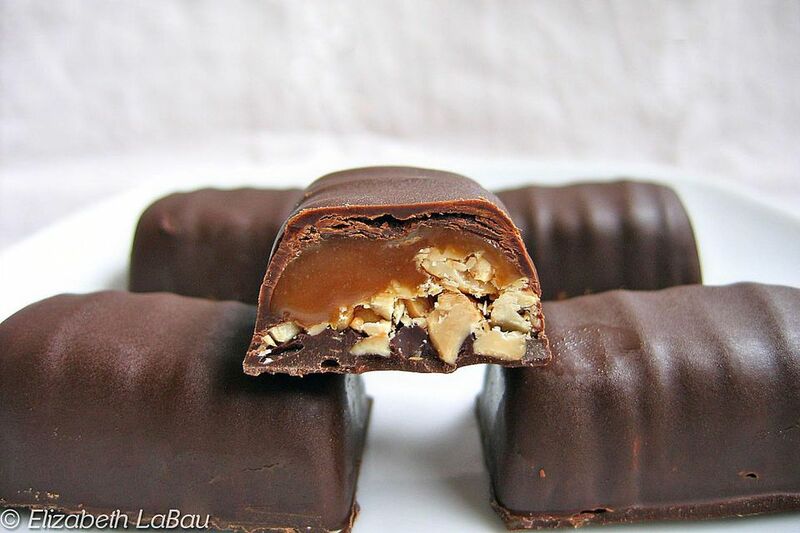 If you use a mold similar to the one I used, you will have extra chocolate and caramel left over, but the amounts listed will ensure that there is plenty to fill and cover the candy bars. Save any unused portions for later use, or enjoy as ice cream or cake toppings. Make sure your mold is clean and dry before using. Place the chocolate over a double boiler and temper the chocolate. Fill the cavities to the top with the chocolate, then invert the mold and swirl it upside down, allowing a thin layer of chocolate to coat the bottom and sides of the cavities. Scrape the top of the mold clean and place it in the refrigerator to set the chocolate. Place the unwrapped caramels, 1 tbsp water, and 1 tbps cream in a microwave-safe bowl. Microwave for 1 minute, then stir, then microwave for and additional minute or until completely melted. The caramel should be smooth and liquid by the end. Allow the caramel to cool slightly until it is lukewarm but still easy to stir. Remove the set chocolate mold from the refrigerator. Spoon caramel into each cavity, filling about 2/3 full. Sprinkle chopped nuts over the caramel to cover completely, pressing the nuts into the caramel. The nut layer should not quite reach the top of the cavities. Spoon some of the remaining chocolate over the candy bars to cover the tops. (Re-warm the chocolate briefly if necessary). Scrape a metal spatula or knife across the top of the mold to flatten the chocolate and to remove excess chocolate from the mold. Place mold in the refrigerator to set the chocolate completely.